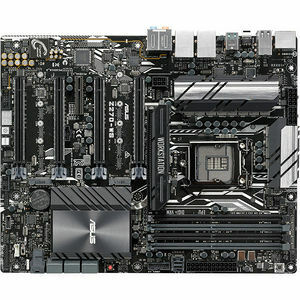 Intel LGA1151 ATX motherboard with DDR4 3866MHz (OC), dual M.2 and dual U.2, Intel® Optane™ memory ready, USB 3.1 Type-A™ and Type-C™ rear-panel connections. The Intel Z270 chipset-based workstation motherboard features on-demand NVIDIA® GeForce® SLI™, NVIDIA Quadro® SLI™ and AMD® CrossFireX™ technology, plus robust troubleshooting features. ASUS Z270-WS accommodates up to four dual-width graphics cards and supports up to 4-Way NVIDIA® GeForce® SLI™, AMD® CrossFireX™, and 2-Way NVIDIA Quadro® SLI™. This makes Z270-WS an excellent choice for designers or other professionals who depend on powerful graphics and performance for tasks such as design and modeling, processing-intensive simulation and 3D-rendering applications - or even for gamers looking for multi-screen gaming and live streaming. ASUS 5-Way Optimization makes your PC smart. It dynamically optimizes essential aspects of your system based on real-time usage - so you get superb CPU performance, everyday energy savings, ultra-stable digital power, cool and quiet fans, and now networking and audio settings that are tailored to your apps. In short, 5-Way ASUS Optimization ensures that your PC is perfect for gaming, entertainment and productivity! Games and demanding applications run swiftly and smoothly with high-performance, prioritized bandwidth and vivid sound. Energy-conserving design saves you money. ASUS Z270-WS features the most comprehensive fan controls ever, configurable via Fan Xpert 4 and the UEFI BIOS. PWM or DC water pumps can be fully controlled, creating the perfect solution for custom or self-contained cooling setups. A dedicated fan header supplies up to 3A for high-speed, high-current fans. A dedicated, integrated circuit protects each fan header from overheating and overcurrent.